I had been on the Daniel Fast for a couple of weeks when I had the dream. The first week, as my body rid itself of caffeine, sugar, and toxins, I had an excruciating headache. Almost as if someone held my brain in their hands and squeezed it on all side, all at the same time. The night I dreamed, though, I felt really good. My headache was gone and I was beginning to adjust to the benefits of a vegan lifestyle. I lay on the bed. My thoughts centered on Jesus. I remember thanking God for the day. I thanked him for leading me. Guiding me. I asked him to speak to me. He did. Isn’t it funny, when you dream, it’s as if you are floating above yourself, watching the scenes unfold. Almost as if you are watching an exciting show on the big screen! We walked along, singing a song. I held their hands in mine. Out of the corner of my eye, I saw him. He was a huge, scaly, ugly, fire breathing dragon. He swooped down from the sky. I saw a white picket fence to my right side, and I was able to hold it up, over my head—like a shield—in one hand, while scooting the children behind me with the other. The dragon flew all around us, snarling and baring razor sharp teeth. I could feel the presence of evil as the dragon continued to threaten us. 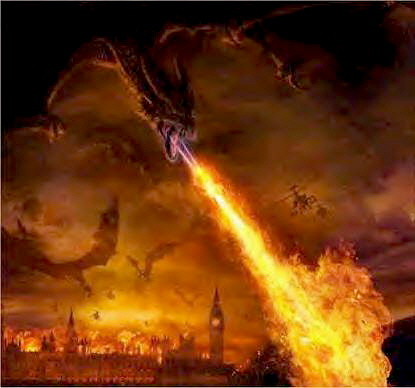 Then, he stopped in mid-air, drew back, and then, with a forward motion of the dragon’s head, he began to breathe fire. I could see intense hatred glaring from his eyes. I knew he wanted to kill me. The fire that proceeded from his mouth was electrified. It was almost as if thousands of bolts of electricity created the fire and made it blazing hot. I looked through the slats of the fence. The children clung tightly to my legs. I could hear the trembling of their bodies. They were frightened. I could see the dragon, but his fire could not get through. When it hit the fence, the fire of his breath flowed over the fence and fell on either side of the children and me. I laughed and told the children not to be afraid anymore, because, even though the dragon looked scary and had the ability to breath fire, he could not touch us right now. We were shielded from his fire. The dragon breathed his fire again, but it had lost some of its potency. I awoke with one thought. He can’t touch me the real me. Oh, yes, I’ve had circumstances that would make you cry. I’ve experienced events that would make you angry. I’ve had problems that disappoint and despair so deep you couldn’t see daylight. I’ve been sexually molested, raped, physically and verbally abused. Yes, I’ve had a lot of stuff happen that was meant to destroy me. And, a good many things have taken their toll on my physical body… but they haven’t touched the REAL ME! The real me is the redeemed, blood-bought daughter of the Most High God. My physical body may be beaten or used, but my spirit is shielded from the torment Satan desires to put me through. God shields the fire from the beast from ever touching me. And, do you know what else is true? God loves you. He knows difficult, and sometimes horrific, circumstances have touched your life. You have been lead into despair, but I tell you, he [Satan] cannot touch the real you! Yes, there will still be days and times when circumstances touch your physical body… BUT, he can’t touch you!